Q. I can view PDFs, but not print. How do I get copies/print? 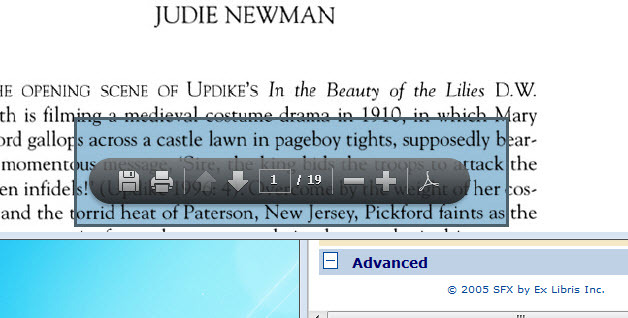 Instead of left-clicking on the "View PDF" link to see the article, right click on it and select Save Target As. Then, open the PDF file from the location you saved it to on your computer. It should open in Adobe Reader, and you can then just go to File, Print. If that doesn't work, you may have to find the Print icon in your browser. Try to hover your mouse near the bottom of the page. A black bar should pop up and in that black bar there is a print icon you can click on, the second icon from the left (see picture below). Sometimes, if you are viewing one of our ebooks, the publisher may disable printing or limit it to a specific number of pages because of copyright. You can get more info at our ebooks topic guide. Please let us know if that does not help or if we can be of further assistance.